There were four as yet unmentioned operas I saw in 2014 which we quite memorable in one way or another. First and foremost was the Sydney Symphony Orchestra / Robertson's semi-staged Elektra. The work itself was enough for enormous satisfaction especially in such good hands. Staging: The concept was to augment emotion and the final dance of death with the Sydney Dance Company. Strauss doesn't need his emotions to be underlined and this soon devolved into more is less. It's all in the music; enough already. Not only that, it now meant the need for a purpose built dance area which ended up being behind the orchestra, as I best recall, built as an elevated platform above the main concert platform, with the 100 plus musician pushed out into the front stalls. And this meant the acoustic was strangely altered and a very dominant score was even more in-your-face. And maybe this alone, or a combination of very exposed orchestral forces in a hall where some, or perhaps all, of the cast voices would struggle to get across, meant that the performance was 'semi-miked'. And by this I mean there were four microphones across the front of the stage to which singers could variably engage to boost their volume. The effect was as weird as it was exciting. 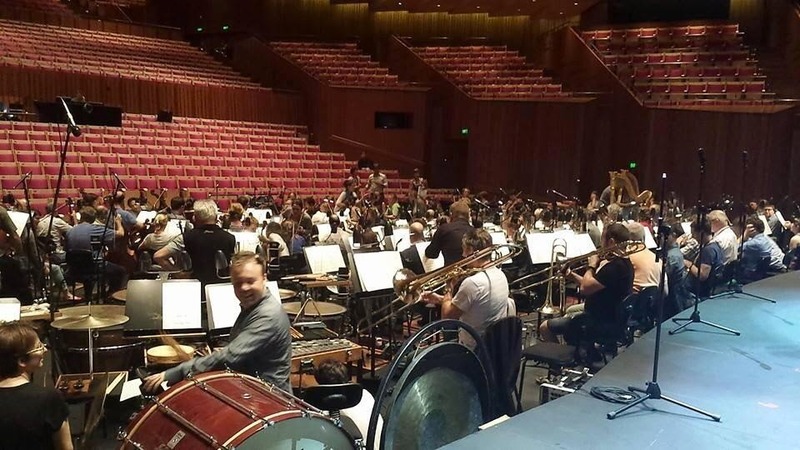 This rehearsal pic is from Ms Goerke's twitter feed and you can see the orchestra protruding out into the hall and the dance platform performance space behind them. Who wants to sing Elektra from behind a fully exposed orchestra? Cast: The sheer amplitude of Christine Goerke was thrilling. She seemed the least in need of finding a microphone and was therefore the more liberated in moving around the performance space, aided and abetted by the force of her personality. And she got into it. On the second night as she wound herself up into the final frenzy, legs and feet running amok, she caught the hem of her dress with her foot and came a heavy cropper where she continued her act of crazy big girl from the fallen position. It looked rather impressive. The return of Liza Gasteen was good casting. She was a stately and steely Klytemnestra. Cheryl Barker was (sensibly) microphone focused and therefore limited in her organic interaction with her horrible big sister. For my taste, Peter Coleman-Wright didn't muster the gravitas necessary for Orestes - the fulcrum of the piece. Kim Begley's Aegisthus was a marvellous slippery bit of evil whose Herod I'd very much like to hear.